Living a greener lifestyle has always been very important to me so our family recycles on a regular basis and we also try to repurpose used items for new uses whenever possible. I found it an interesting fact to learn that while “7 out of 10 Americans say they always or almost always recycle, only 1 in 5 Americans consistently recycle in the bathroom.” That means that each year Americans trash enough shampoo bottles to fill “1,164 football fields”……..that is a massive 18,000 tons of plastic that could have been recycled or repurposed instead of ending up in a landfill. Therefore, Johnson & Johnson has committed to making a difference through the Johnson & Johnson CARE TO RECYCLE™ campaign. 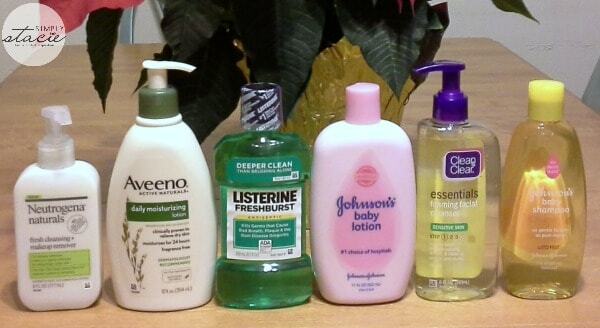 Their goal is to encourage more people to recycle items in their bathroom including shampoo and conditioner bottles, body and face wash bottles and lotion containers. When thinking about my own commitment to recycling, I quickly realized that my family could certainly do more. Have we been checking for recyclable plastic identifications on all of our plastic products or simply tossing in the trash can? Can that shampoo bottle be turned into a fun and creative project for the kids? My children creatively try to repurpose lots of different items and thanks to Johnson & Johnson they have gotten lots of fun new ideas. 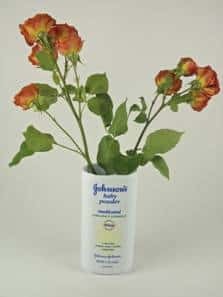 How about turning Johnson’s Baby Powder into a flower vase, change holder or trinket box? 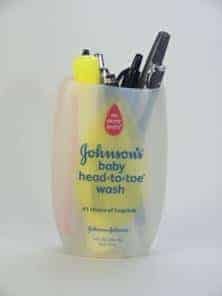 That empty Johnson’s Baby Head-To-Toe Wash container could easily be turned into a nifty holder for pencils, crayons or pens and my son had the idea to turn an old shampoo bottle into a holder for his paint brushes and watercolors. There are so many interesting and useful ideas that the sky is really the limit with what you can transform an old bottle into when it is empty. Are you interested in learning more about how recycling and repurposing can help when OUR BABIES WILL INHERIT OUR PLANET®……hopefully a world that has preserved our natural resources for them to enjoy for generations yet to come. You can help make a difference by visiting the Care To Recycle™ Tumblr page which has lots of helpful tips and useful information on what you can and cannot recycle as well as fun ideas for repurposing. There is even a short video you can watch and if you decide to share it with your family and friends Johnson & Johnson will donate $1 to Keep America Beautiful which provides recycling bins to schools across the United States. Every small step we are willing to take together can make a big difference to our children’s future! A group of us are going to be handing out care packages to the homeless next week , & in those packages are a bunch of sample bottles of toiletries(along with other things). Presents a problem & I’m not sure how to handle it.